This vessel is all welded aluminum construction hull, sides, decks and superstructure convertible Sportfish style with flybridge on top. Flush fore and side decks and aft cockpit area diamond deck set below gunnels. United Yacht Sales New Jersey would love to guide you through a personal showing of this 54' Breaux Bay Craft 1977. 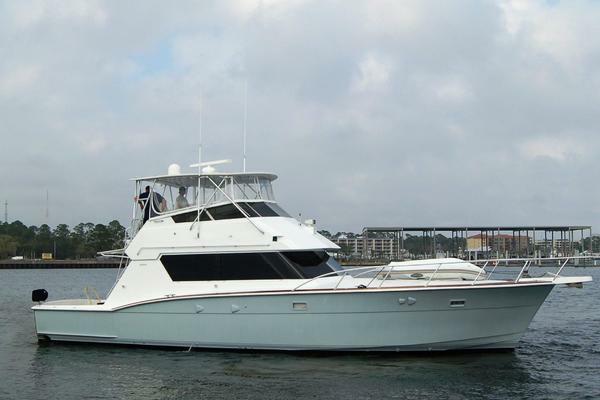 This yacht for sale is located in Pass Christian, Mississippi and priced at $269,000. For a showing please contact us by filling out the form on this page and we will get back to you shortly! Galley up same level as main salon. Port forward teak wood cabinets with counters. FORCEIO, three (3) burner electric stove with oven, double stainless steel sink, GE microwave over,Two (2) Vitrofrigo three drawer type refrigerator/freezer. From main salon to galley port forward. Downstairs to 2 double berthsport side, 2 sets double bunk "V" berths forward with 2 more double berths starboard. Head starboard and head, sink, and full shower to port side. Four (4) step aluminum ladder to main salon access. Interior/state way finished with varnished wood walls, veneer flooring and marlite ceilings. Twin 2006 Cummins Diesel QSM11 750 HP each, 2,054 Hrs(At Time of Listing), twin disc gears. Modified planing V - hull.2014 Kubota 22 kilowatt generator(1,426 Hrs at time of listing) located in engine compartment aft, freshwater cooled through heat exchanger, wet exhaust system with exhaust hose to muffler. Starting battery - 12 V DC. Fuel: One (1) all welded aluminum 1400 gallon capacity, located below cockpit centerline, well secured, vented with shut-off valves on tank.Water: One (1) all welded aluminum, approximately 375 gallons, located forward in center bilge, well secured & vented. Piped through Aqua Air/Bladder pressure water set.Holding: One (1) all aluminum, approximately 164 gallons, located forward engine room, well secured, vented with holding tank discharge and proper marine type sanitation hose. Eight (8) gunnel mount rod holdersRocket launcher - bridgeBait/tackle station in cockpitRupp triple spreader with flybridge release, center rigger.Full size swivel fighting chair with adjustable foor pedestal and gimble style rod holders.Dual cockpit freezers with aluminum frame fold up cockpit cover.